Metal braces are commonly used to correct the misalignment of teeth, especially in children. They are used to treat various conditions such as overbite, underbite and crooked or crowded teeth. In some instances the procedure is cosmetic, but in most cases it is undertaken to help improve the alignment of the person’s bite. The most common reason for braces being required is crookedness of the teeth before and during adolescence. As the adult teeth grow whilst the jaw is still developing, this can lead to the teeth becoming crowded in each jaw. This in turn leads to teeth turning edgewise or overlapping. Other reasons for this type of orthodontics being performed might be an overbite caused by excessive thumb-sucking in childhood. Accidents may also be a factor. Many adults are also treated with orthodontic braces to correct misalignment not detected in childhood or for cosmetic reasons. Metal braces involve brackets that are glued to each tooth. Each bracket is attached with elastic ligatures to a wire-known as the arch-which encircles the teeth. This in turn is attached to a buccal tube at the end of each row of teeth to hold the arch firmly in place. A system of rubber ties and ligatures is used to attach one set of teeth to the other and provide pressure to realign the teeth. Where teeth overlap, spacers may be included to separate them prior to alignment. Dental braces work by applying pressure to the teeth to correct misalignment. This causes the bone in each jaw to reset around each tooth to enable it to reach its desired position. Ligatures are applied by orthodontic dentists to pull, push and twist each tooth in the desired direction to achieve perfect closure of the jaw and teeth. Repeated visits to the dentist will be necessary so that they may adjust the braces periodically. In some cases, the dental misalignment may be caused by other jaw malformations, and orthodontic dentistry may be used alongside surgery and physiotherapy to realign the jaws and teeth. Modern dental braces are designed to be as non-invasive as possible. Tooth removal-to make room for ligatures-has been replaced by spacers that create room between teeth. Braces may now be coloured to blend in with the colour of the teeth. 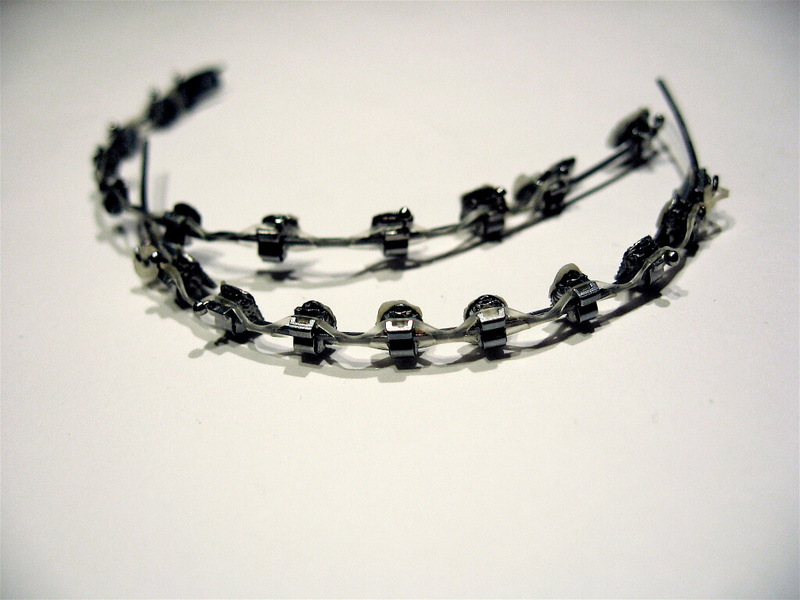 Some types of brace are designed to go behind the teeth to be hidden completely, and some orthodontic procedures involve headband braces worn at night. Modern braces also use metal arches that are wired directly to the brackets to speed up the realignment procedure. With braces, there is always some degree of discomfort. However; professionally-trained dentists are skilled at achieving quick results with the minimum of discomfort, and they will be happy to discuss the best approach with the patient.